The tank's hood is constructed of surplus 16oz roofing copper sheet (also hammered). 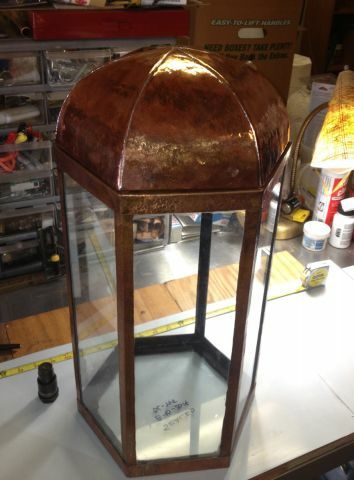 Six panels formed into a domed "turban" shape. The panels were clamped and the flanged edges were soldered together. This hood will house eighty-four 5630 SMD LEDs. 2amps @12v (24w). Seems like a lot, but fifty-four 5630s was just right for one of my 5 gallon Metaframe planted tanks, which only has about 2/3 the tank depth.